Travel loans, 100% online, 60 min outcomes. Up To $5,000. Apply now! Travel Loans, 100% Online Loans, Quick Outcomes. Apply Now! Here at Nifty Loans, we understand that itchy feet feeling. Has it been a while since you managed to commit to a good holiday away? Or, perhaps you’re planning a much bigger trip than normal? If you’re craving the wind in your hair or the taste of adventure, but are struggling to see how you’re going to finance your venture – you’re in the right place. Or maybe you need to do some emergency travel overseas due to unforeseen circumstances? 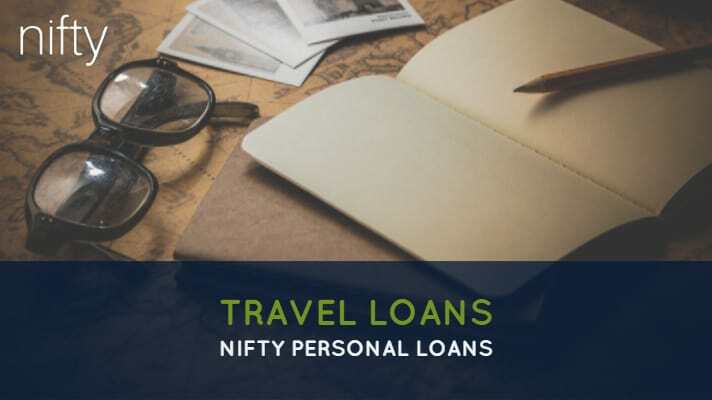 Regardless of whether you’re planning your dream trip, or heading off on business, Nifty Loans is here to help you out with travel loans. And to sweeten the deal for you, we’re also going to give you a bunch of our personal favourite money saving tips, to get you where you need to be, faster! So get your pen and paper out, cause Nifty Loans is about to give you the lowdown on all things travel! They are small fast online loans for those wanting to travel. Whether you’re wanting to travel quickly, take advantage of a deal for future travel or looking into finance to contribute towards plans you’ve already booked, Nifty Loans can help you out! Our loans are 100% online and we pride ourselves on our super fast assessment times. Our assessment team works hard to process each and every application with lightning speed and we aim to have your application assessed within 60 minutes, during normal business hours. If we haven’t reached an outcome for you within 60 minutes, don’t panic too much, we may just need further information or documentation. Have questions regarding your application? Not a problem! Give us a quick call and we’re happy to help you out with any queries you may have. What do I need to qualify for travel loans? We’ve made it super simple to be eligible for a loan. Does this apply to you? Great! Feel free to head to the top of the page and hit the APPLY NOW button. Just fill in our super quick application form and get your loan application processing now! Can I get travel loans if I am receiving Centrelink benefits? You sure can! Here at Nifty Loans, we are happy to accept Centrelink benefits as a form of regular income. So, if you’re receiving a regular Centrelink benefit into a personal bank account, you’re eligible to apply! Just scroll to the top of this page, hit the Apply Now button and we’ll do our best to get you an outcome within 60 minutes during normal business hours. We encourage anyone to apply and we’re happy to take a look at your application for you. If you have any questions at all or are unsure whether you qualify don’t hesitate to give our friendly customer service stars a call or email. They’re happy to discuss any questions or queries you may have and enlighten you on all aspects of Nifty Loans! Do you perform credit checks on your travel loans? As responsible lenders, we perform credit checks on all of our loans, be they green loans, bad credit loans, or travel loans but they’re not the only criteria that we look at. We believe that your credit report isn’t the be all and end all and shouldn’t automatically exclude you from being eligible. We also carefully look at your current financial situation and how you’re handling your money now and take all this information into account during our assessment. We understand that sometimes things can happen that are out of the ordinary. Sometimes these circumstances can lead to a bad credit score. But we don’t judge you solely on your credit score alone, which is why we also look at your current financial circumstances. By looking at your current relationship with money as well as your credit report we aim to ensure that a loan is right for you and that you can afford to repay it within the responsible lending guidelines. Nifty Loans can help out with bad credit loans . This is why we encourage our clients to apply or have a chat with our friendly customer service advisors to see how we can help you! If you’re looking for cash loans for bad credit, apply with us today! Have more questions? The Australian Government website, MoneySmart, might have the answers for you. We make repaying your loan super easy for you. If your application is approved we set up your repayments to be automatically direct debited in line with your payday. No need to remember about making your repayments as we do everything for you! However, we do advise to also keep track of your repayments and ensure the funds are available in your account on your repayment day. The direct debit for your repayments will also automatically stop once your loan has been paid back in full, so you won’t need to worry about overpaying or having to remember to call in to finalise everything. How easy is that? Nifty Loans travel saving tips! We’re not just here to help you apply for travel loans! So, you’re planning your next big adventure (maybe to Fjij!?) but you’re suddenly wondering how on earth you’re going to save up all the funds you’re going to need? If you’re like us and have decided to go big or go home, you’re going to need some serious cash behind you. Welcome to the conundrum we all have when planning where we want to go exploring. If you’ve been hit with a bit of wanderlust and you absolutely cannot, nay will not sacrifice any of those dream locations, we can help you get where you need to be with our handy-dandy savings tips and tricks! And if you’re thrifty enough, you won’t even have to give up the smashed avo before you go jetting off. As monotonous as it may sound, creating (and sticking to) a realistic budget is going to be your best friend in your savings journey. Figure out all of life’s little necessities that we need to pay for to appear to be functioning adults (rent, utilities, food, loan or credit cards repayments, to name a few) and see how much your essential outgoings is per paycheck. Now, what about those other expenses that aren’t perhaps a necessity? Yes, Netflix, Spotify, that daily coffee or cafe lunch, we’re looking at you. Are these things actually really a necessity? Are you going to die if you absolutely cannot watch the latest show on Netflix? No, we didn’t think so. Cut them from your budget and just watch your savings increase. It really is amazing to see just how much these little expenses amount to. Now we did promise that you could continue your smashed avo addiction, right? We certainly did. But, it’s time to get smart about your spending habits. Instead of hitting your local cafe for your avo addiction, how about doing a grocery shop, picking up your ingredients on the cheap and making your avo at home? See, easy. Not only will it be a bunch cheaper than if you bought from a cafe, but you’ll likely have a bunch of leftovers as well. That’s right, midnight snack! Little things such as changing which supermarket you’re shopping at can make such a huge difference to your savings. Aldi is about to become your go-to. Love a cheeky night out with the squad? Yea us too. Consider being the DD and taking one for the team. This will not only lead to a (remarkably) cheaper night, but a lot of venues love DD’s and will offer up free non-alcoholic drinks! If you absolutely have to have one or two with the girls, consider pre-gaming before heading out. Avoid the hangover and don’t be scared to check your bank accounts the next morning! We’re all guilty of a little retail therapy. But in the lead up to your upcoming trip, try reigning back on your spending. Yes, we know just how much you think you NEED those new shoes, and that trendy jumper you’re probably only going to wear once, but really are they completely necessary? No, we didn’t think so. Those random little purchases that we’re all guilty of (a book here, a pair of shoes there, a new piece of technology every few months?) are notorious for eating into both your budget and your savings account. Make do with the items that you already own and cut back on these unnecessary expenses for a while, and your savings account will really thank you. As much as we love and support the whole “treat yourself” mentality, perhaps for just a little while, you should refrain from treating yourself! It’ll be worth it in the long run, we promise. Consider selling off some of your unused items! Let’s be honest, we’re all hoarders at heart. Do you have a wardrobe full of clothing that you don’t wear anymore, but can’t bear to throw out? Sell it. You’d be amazed what people will pay for good quality used clothing. How about some old technology just sitting there not getting used? Chuck it on eBay or Gumtree, after all, another man’s trash is another man’s treasure. Not only can you declutter your life a bit, but you’ll have a sizeable amount of money towards your travel savings. Life is already expensive enough without adding a bunch of unnecessary expenses on top of this. Why not get creative and have a bit of fun with your spending habits? You don’t have to live like a beggar for the months leading up to your travels, but you can definitely cull a lot of those expensive habits. If you’re serious about succeeding at your travel savings dreams you’ll be able to make the necessary changes to achieve your goals. We believe in you! And if, at the end of your savings journey, you find that you still need a helping hand to cover your last expenses, think Nifty Loans. If you have been surprised with an unexpected situation that requires you to travel soon, think Nifty Loans. We specialise in fast, easy, 100% online travel loans Australia to help you get where you need to be, quicker. So, take a trip to Fiji or whatever tickles your fancy with Nifty Loans! "Always great service from nifty, hassle free, quick, highly recommend it to my friends. Keep up the customer service guys." Travel Loans, 100% Online Loans, Quick Outcomes. Apply Now! Overall rating: 4.6 out of 5 based on 232 reviews.